It was unseasonably cool this April — many days that did not leave the 50s — and rainy, too. Getting wet on a rainy day is one of my pet peeves. Actually, it makes me furious. So, my typical strategy on a rainy day is to wear rain boots and knee-length dresses and limit the soaking to my outerwear. If it rains a few days in a row, something inside me snaps and I pull out the sloppy clothes. Indestructible knit pants and sneakers. With that said, I really like this outfit. For starters, I love my new sneakers. When they are slightly peeking out from wide-legged trousers, they almost look like real shoes. I am also crazy for this blouse. I told all of you to buy it two weeks ago, but I don’t know if anyone picked up my special Sunday PSA. The blouse is still available on Shopbop. 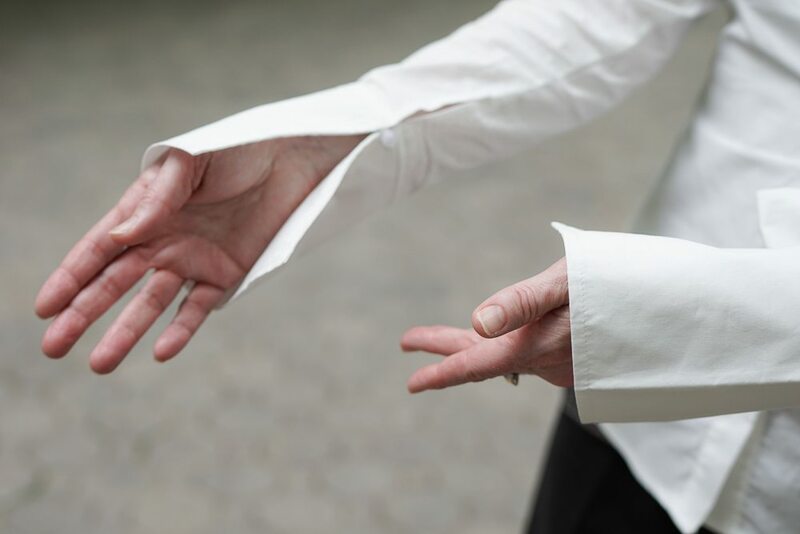 Long, elegant cuffs are finished with a small button above the wrist. 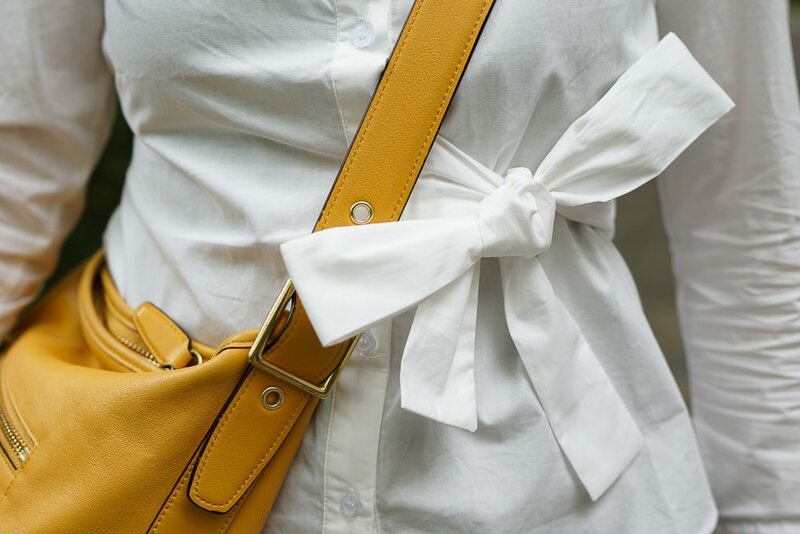 A sculptural bow adds interest to a menswear-styled oxford. The ties are long, so I’ve tied a double knot to make the bow more emphatic and compact. 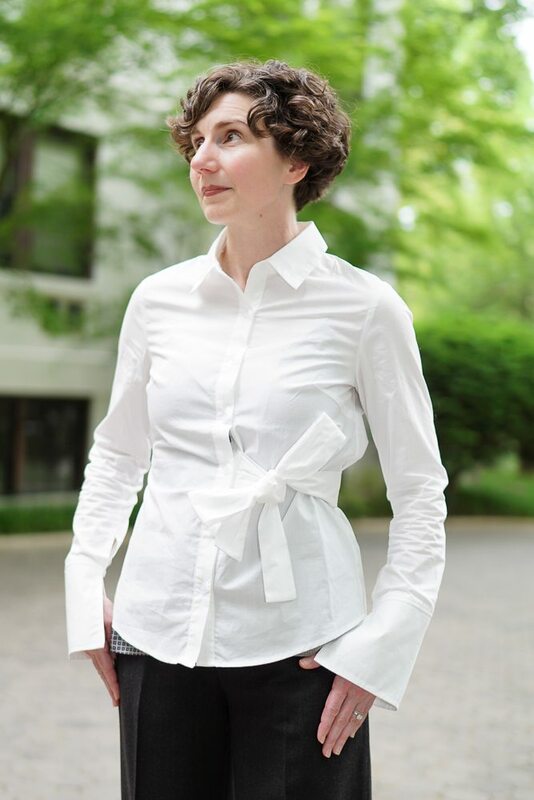 The ties go three-quarters of the way around the waist and cinch the blouse. This is an excellent solution to the typical problem with oxford shirting: a boxy silhouette. Perhaps the eagle-eyed have noticed something peeking out from the hem of the blouse? It’s a printed camisole in various shades of grey. It just barely shows through the blouse, but adds a little extra interest. You may remember that I have this camisole in a pinky-peach color and a related slip dress in navy. This camisole is full, but the silk is very light and therefore fits easily under the blouse without adding bulk. The sides of the camisole are split and this allows additional movement and ease. Is that my left or your left? How about I stare straight ahead? Love the shoes. Do I win a prize (a Directrice give-away perhaps?) for knowing where the caption “Is that my left or your left?” comes from? I put that in there for you. I knew you would know. How do you feel about Cleveland? Love a good, emphatic bow! Can’t stand the inconsequential kind. I think the blouse is great and looks really good with the pants and fun sneakers. The question is how does this outfit keep you warm and dry? Well . . . it doesn’t keep me warm and dry, exactly, but the pants don’t show the wet and the shoes aren’t ruined by rain. The pants also dry quickly! I’m honestly not sure about the camisole under the blouse. It seems to me that it competes with the lovely curved hem of the blouse. 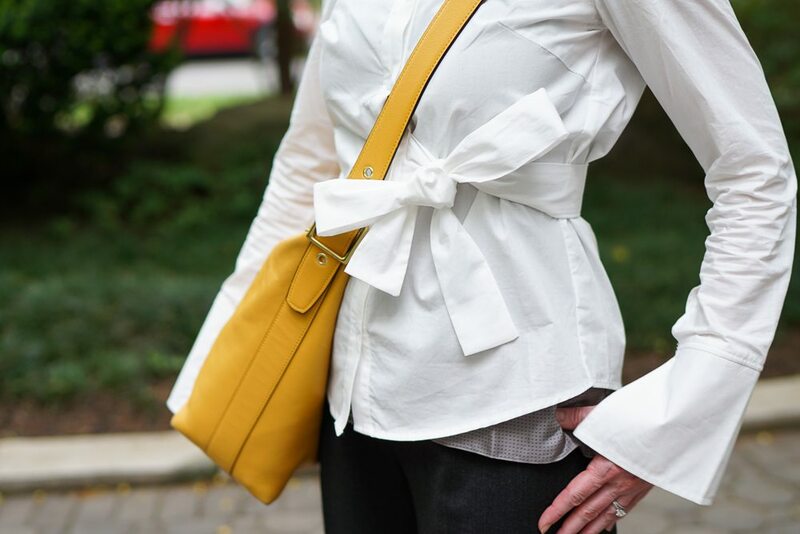 The white blouse is lovely – can you comment on its sheerness and its fit (with respect to the latter, as compared to JCrew sizing)? 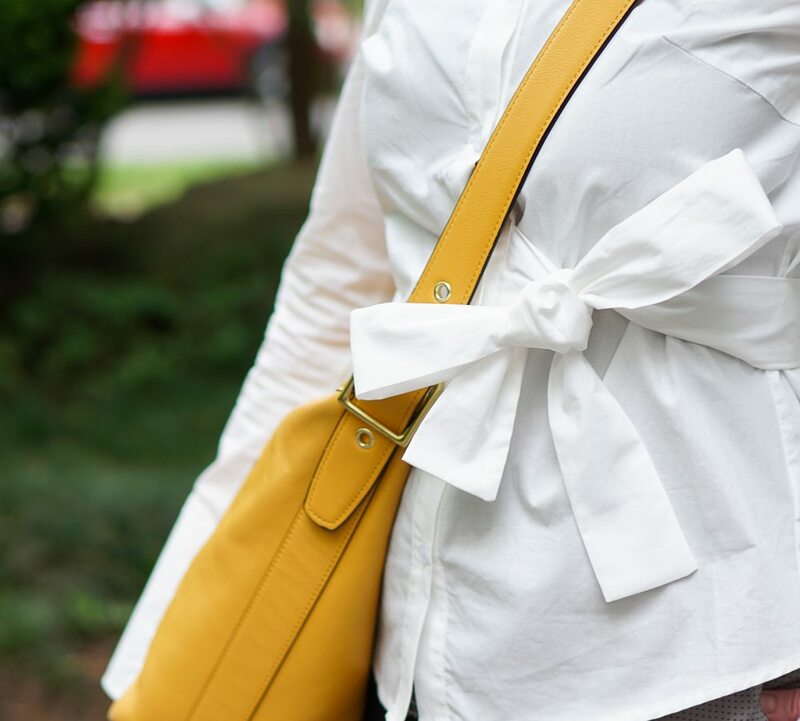 The ShopBop photo makes the blouse look more opaque and boxy than you do (e.g., in the “explosive bow” image, I imagine I can see traces of your camisole pattern). Please do show us your outer rain gear! I’m in Oregon…. I need stylish inspiration for our weather! Love the top – and the pants are wonderful with the cuff. Hi Elena — These cuffs aren’t bad; I can turn them back pretty easily for hand-washing. The sweater with the big floppy, split sleeves that I showed a few weeks ago (Dying Swan) are a challenge.